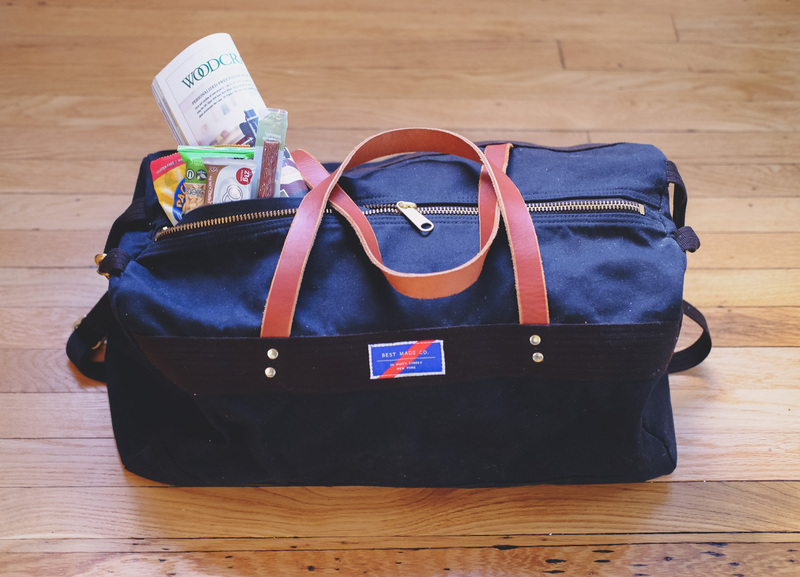 Hospital Bag Essentials - Bash & Co. I woke up in a state of panic as I felt baby girl “drop” – it seriously felt like I was on the downhill of a roller coaster followed by some intense Braxton-Hicks. I honestly don’t remember having the same sensation while pregnant with Bash, but it jolted me awake at 4 AM Googling “signs of early labor”. While it’s totally normal for baby to drop 2 – 4 weeks before delivery, some say that it happens closer to labor for subsequent pregnancies, so I went into full panic mode with so many things left to do on my Third Trimester Checklist. Thankfully, the Braxton-Hicks passed, but it definitely kickstarted me into action to get my hospital bag packed and ready to go. While pregnant with Bash, I started packing my hospital bag around week 35 (I kept having crazy, vivid dreams that he would be early). I had his baby gear and most of my supplies packed, along with a checklist of toiletries, clothing, and other essentials I’d need to pack during the onset of labor (which kept me distracted and gave me something to do while waiting). 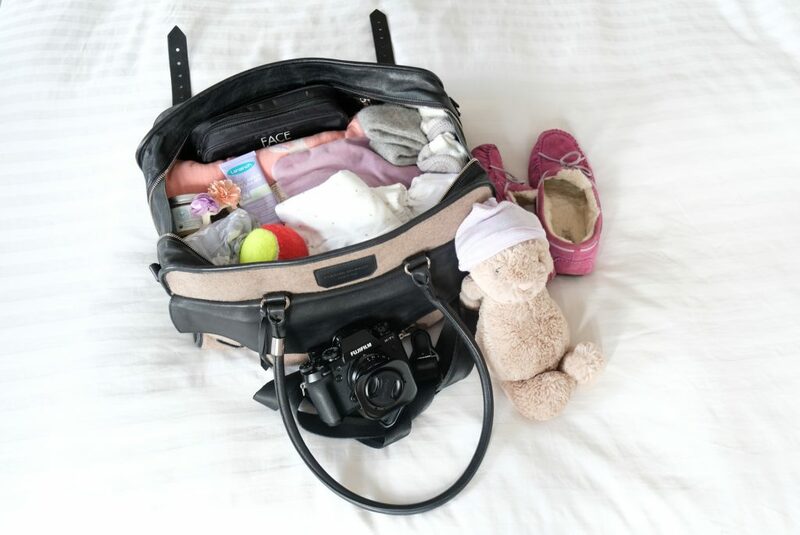 As a first-time mom, I way over-packed, arriving at the hospital with my purse, diaper bag, work bag, and my trusty “consultant’s sidekick” Tumi wheelie suitcase. While it can’t hurt to be over-prepared, I probably looked like I was jetsetting off on a European vacation. The reality was that we were a 10 minute cab ride from home, for a 2 – 4 day stay (depending on delivery), the hospital provided everything we needed (and more), and I was pretty exhausted / overwhelmed to even use half the stuff I packed. This time, I plan on limiting it to a weekender bag and my everyday tote I use as a purse. Depending on your preferences and how far away you live from the hospital, you really don’t need to bring a lot of stuff. The hospital is going to have all of the newborn baby gear and postpartum care supplies during your stay and you’ll want to have some room to lug home your postpartum goodie bag. 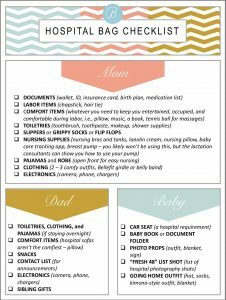 So, here’s what I’m packing (and skipping) this time around, along with a printable checklist that will hopefully come in handy for some early labor distraction. Going home outfit – thinking I’d be all Kate Middleton, I brought a dress for going home. But my legs were so swollen and several weeks unshaved (that belly can sure get in the way), I wound up wearing the same maternity leggings I arrived in (which also had much better support for the ice diaper you’ll be living in). I went to one of the hospital’s breastfeeding workshops down the hall and was probably the only one actually in clothes; most just came in their hospital gowns, so think comfy and stretchy! Comfort items: whatever will make your labor and stay more comfortable whether it’s a pillow from home, tennis balls for massages, lavender eye pillow, music, etc. Snacks: the reality is that these are most likely to be eaten by your partner as you likely won’t be allowed to eat anything other than ice chips as your labor progresses. After delivery, food was the last thing I was thinking about, but many friends have mentioned they were famished after delivery. Our hospital had pretty good food (including a cute, personalized, tasty cake) and our visitors brought lots of goodies! Champagne: My first time around, I thought as soon as I delivered Bash, confetti would fall from the ceiling and champagne bottles be poppin. Um….no! Although a celebratory toast would have been nice, champagne was the furthest thing from my mind post-delivery. I was in a weird state of exhaustion + euphoria, and I just wanted to hold my precious new baby. Plus, you are nursing around the clock for colostrum and to get your milk to come in, so it’s probably best to delay the celebratory champagne. Work Stuff: As I went into labor a few days early, I brought my work bag and laptop as I had a few scheduled conference calls for that day. Call me crazy, but while waiting for labor to progress and feeling generally okay, I thought I would get a little bit of work done in the morning. While I honestly was about to hop on a call, I decided to pass it off to my colleagues to prevent any awkward moments when the nurses came in to check on progress. After that decision, the work computer never made an appearance and was just another bag to lug around. Even if you’re feeling good during labor and want some distractions, I’d suggest some chill entertainment – magazines, download some shows, play cards, or try to take a nap and rest up (easier said than done!). Postpartum Supplies: Save all of your pre-purchased supplies for home! The hospital will have everything you need and don’t forget to ask for extra supplies to take home. Personally, the hospital’s mesh undies were perfectly fine for me (definitely not glamorous, but stretchy and disposable are key!). This section really depends on how far away you live from the hospital and your rooming situation. Nick doesn’t even remember packing a bag for himself. Even though we were lucky to get a private room which allowed him to stay overnight, he didn’t bring a lot. Since we were close to the hospital, he went home to shower and change. (Side note, we highly recommend a private room, sharing a cramped room with a neighbor and newborns is not a great way to rest post delivery). Diaper bag and newborn care supplies: The hospital will provide everything you need to care for a newborn over the first few days. Unless you have a specific preference for brands / products for your baby, I’d recommend just using the hospital supplies (you’re paying for it anyways). If anything, bring the diaper bag empty so you can fill it with the stash of extra newborn supplies from the hospital. We came back with extra diapers, formula, a blanket, hats, a couple of kimonos, a bulb syringe, saline spray, and samples. And that was just baby’s stash. What were your hospital bag essentials? Anything you wish you had the first time around? You are prepared….best wishes for your and your family! Loved the hospital mesh undies and used them at home afterwards. Best of luck to you! What a sweet Hospital Bag. Love it. I was also looking for a bag for my baby. So,thank you very much for sharing this blog.